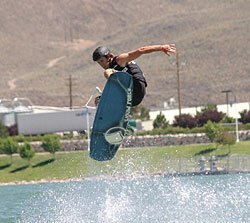 Photographer Kaben Schuma provides Wakeboarder.com with a series of action and podium photos from the 2004 Reno Pro Wakeboard Tour Stop. The event was won by Phillip Soven with Danny Harf and Shawn Watson coming in 2nd and 3rd. The Women's division was won by Emily Copeland Durham followed by Dallas Friday and Maeghan Major. The Wakeskate division was won by Brandon Thomas followed by Phillip Basino and Chase Gregory. View the Photos in the Media Center.